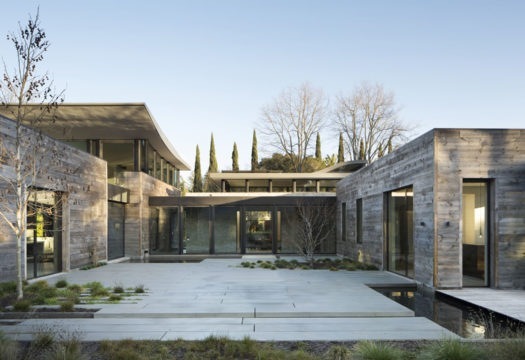 Fantastic worlds, daring geometries, disorienting perspectives, figures that intersect and graphic signs that race in different directions: the impossible constructions of Maurits Cornelis Escher are the starting point for the design of this new residence in California. 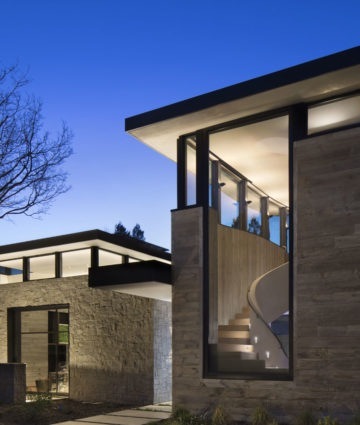 Two of his great admirers have designed their own home, with the help of the firm Ken Linsteadt Architects, starting precisely with his works. The project relies on alternation of full and empty zones, opaque and transparent surfaces, volumes that intersect and perspectives that interact to create a complex set of relations. The villa is composed of various interconnected volumes and explores the intersections of spaces, figures and geometric solids in its layout. 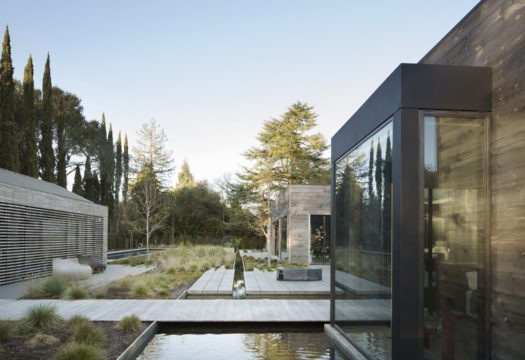 Simple square volumes are joined by a tunnel-skylight, while a grid of slender canals and pools of water overlays the design of the outdoor paths, which from the patio lead to a small waterfall and a cypress grove. The elevations clad with wooden planks or stone slabs feature openings that make use of the OS2 75 and EBE 65 galvanized steel sections in burnished black by Secco Sistemi, whose texture establishes a dialogue with the other materials to produce the “raw” effect that is the project’s stylistic signature. The solutions offered by Secco Sistemi make it possible to create regular contours of the windows and to design the borders of the large glazings of the villa, contributing with the great versatility of the design of the casements to establish a sense of continuity between circulation routes inside the house and the geometric design of the paths in the garden.